Queensland also known as the Sunshine State, is known for its Great Barrier Reef, tropical islands, rainforest, lots of great National Parks, perfect beaches, lots of bush camping, tourist hot spots such as Arlie Beach and the Whitsunday Islands, the Gold Coast, Sunshine Coast, the Great Barrier Reef, Cairns and Port Douglas. 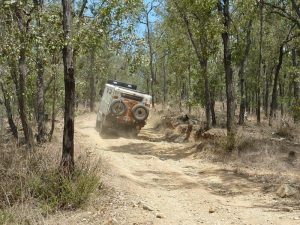 For those more interest into the bush and soft off roading head to Moreton Island, Stradbroke Island, Fraser Island, the Gulf Region, Cape York and the far western Part of Queensland between Birdsville and Boulia. 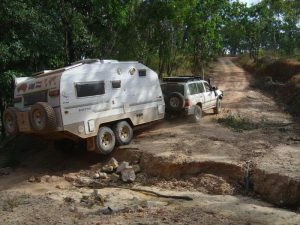 Word of warning for our international overlanders. 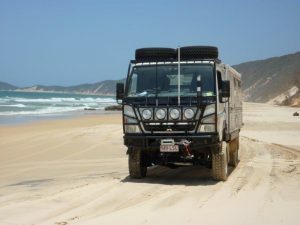 The outback, Australian deserts and to some degree our beaches are very different to the terrain you are used to in Europe, Africa or South America. 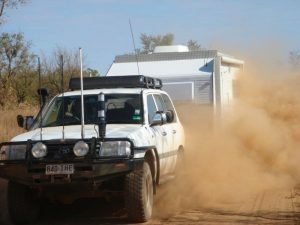 If you are travelling remote ensure one person in the vehicle has first aid knowledge, make sure you have proper communication equipment. 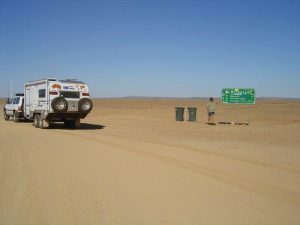 Min Satellite phone, UHF radio, and if possible HF radio (available for rental) let people know where you are going and call in to advise them you have arrived. 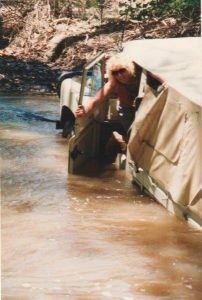 Travel well within your capabilities and when crossing rivers in the North be aware of Crocodiles, same applies to those who like fishing, Freshwater Crocodiles are not as dangerous however they bite and do a lot of damage. 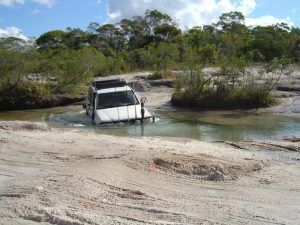 The beaches of Australia have some very soft sand in particular when you have to drive above the high water mark. 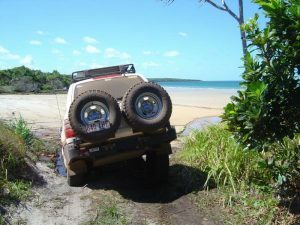 Driving the beaches on a outgoing tide is what I recommend when turning on a beach always turn towards the water to avoid driving uphill and turning in soft sand. 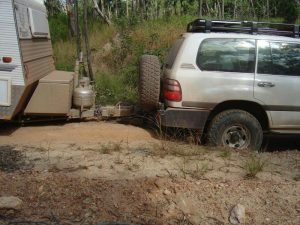 Tyre pressure very important in our land cruiser I have been down to 10 psi. 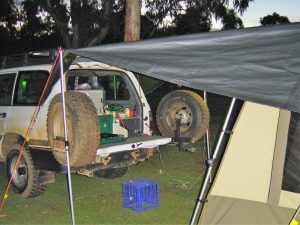 My suggestion is start at 25 psi and go down in 5 psi lots as required and keep the speed down. 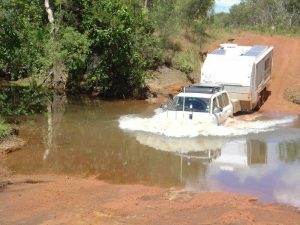 Be aware of deep rutted tracks, bull dust, mud, soft sand on beaches and inland tracks, deep water crossings all combined in one day of driving can be a challenge and can break parts in your vehicle not to mention being stranded mid stream with a flooded engine. 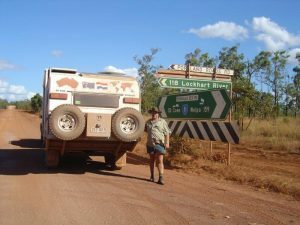 Be warned do not become one of those people who know it all Australia’s outback is unforgiving. 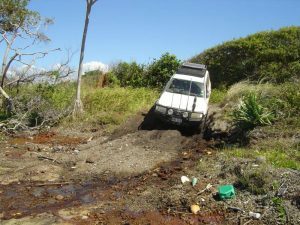 This area starts just north of Cairns and is not just for off road adventures, it also offers remote beaches, aboriginal art and the opportunity to visit Australia’s most northern point just a few kilometres away from Papua New Guinea. 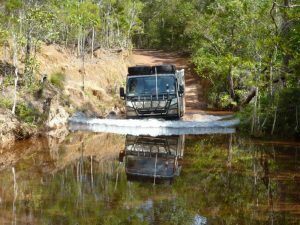 Cape York is a large area of land with abundant river systems, crystal clear creeks, rough roads, graded roads and rutted roads (something for everyone), spectacular waterfalls, great beaches and rainforest. 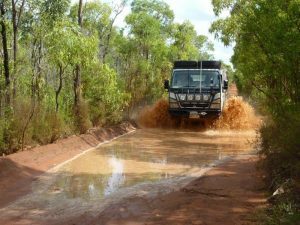 Roads have been improved over the last years and facilities are now open year-round. 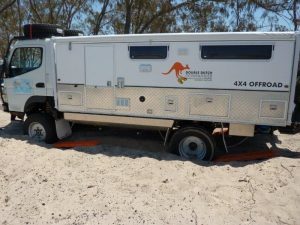 For those who like a challenge you may try the old Telegraph Line, Prince Charlotte Bay and a beach run from Usher Point to Captain Billy Landing. 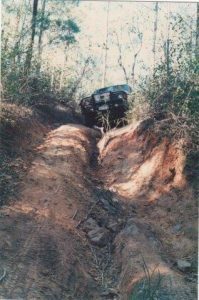 For the soft off roaders and those in sturdy 2WD follow the main tracks. Not to miss is Lakeland National Park. 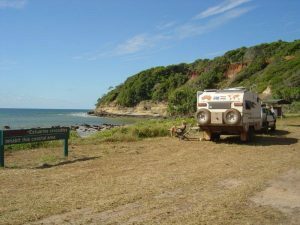 Coming from Cairns via Cape Tribulation and Cooktown this is the first park you will enter. 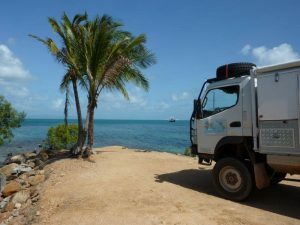 Once you leave Cairns it is around 900 Kilometres to the Tip of Australia. 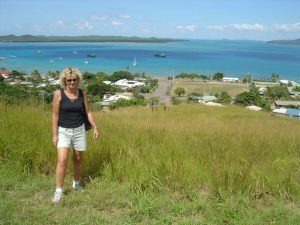 Just 18000 people live on the Cape and 99% live in the towns of Laura, Coen, Weipa, Bamaga, Thursday Island and Cooktown. 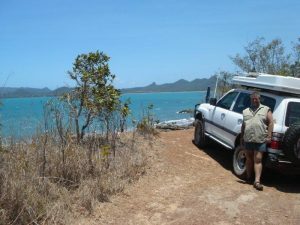 60 % are Aborigines and Torres Strait Islanders. 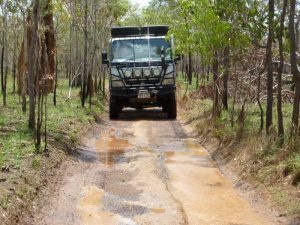 More and more of the main track has been sealed over the years however in the wet season the road does get cut for short times. 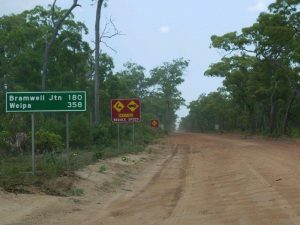 (after heavy rains or cyclones) From Lakeland to Weipa (550km) the road is called Peninsula Development Road, and this is the main road used by all vehicles including road trains. 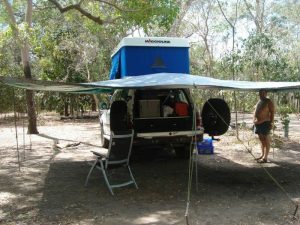 With billabongs, fish filled rivers, huge termite mounds and some rainforest, this is Lakefield National Park. It even has some European history at Old Laura Homestead. 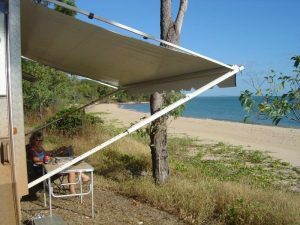 Lots of great campsites, probably the most popular is Kalpowar from where you can cross the river and join the track to Cape Melville and Prince Charlotte Bay. Our favourite and home to Chilly Beach and Portland Roads. 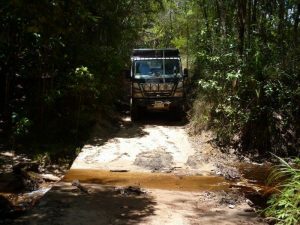 This is located just north of the Aboriginal community of Lockhart River. 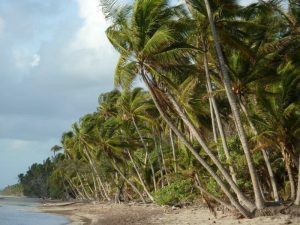 The great tropical beach and camp area at Chilly Beach has lots of coconut palms, white sand and turquoise waters where you feel like Robinson Crusoe if you visit outside the busy months. 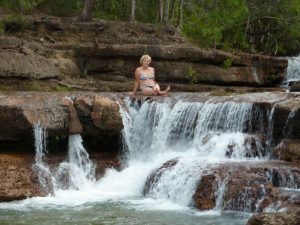 This park is known for 2 great swimming spots. 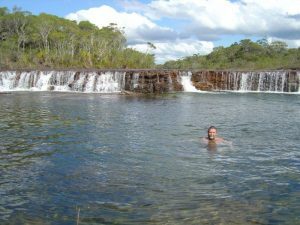 Elliot Falls and Fruit Bat Falls both are Crocodile free and great spots to cool off. 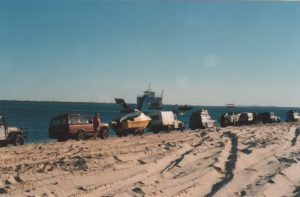 The other 2 great spots in the Park are on the beach, Captain Billy Landing and Ussher Point. 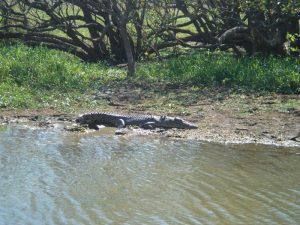 Be Aware the North Queensland Area north of Townsville (and some areas south of Townsville) are home to crocodiles. 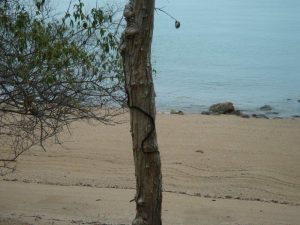 At Cape York crocodiles are not just in creeks, billabongs and rivers but also in the ocean and they are dangerous. 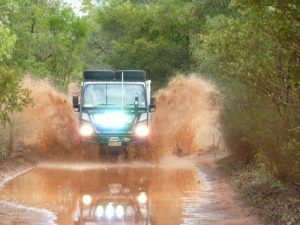 Once the first heavy rains start National Parks normally close in mid December. 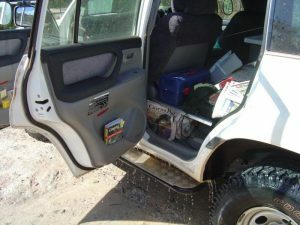 Your vehicle needs to be in perfect condition and good tyres are a must. 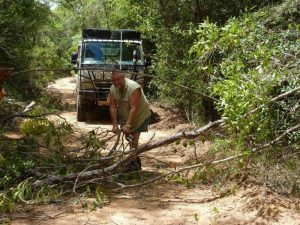 Carry a UHF or HF Radio or Satellite phone if you decide to go off the main tracks. 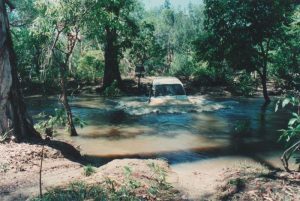 Some river crossings are/could be deep with water over the bonnet. 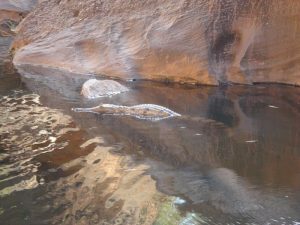 (Do not cross fast flowing rivers) Be crocodile wise and do not linger on the river’s edge. 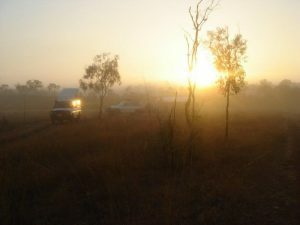 This is just a 3 to 4 hours drive north of Brisbane (subject to the traffic). 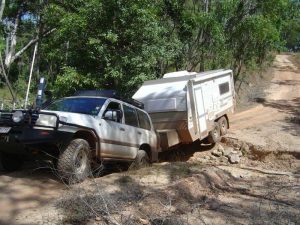 This would be one of the best soft off-road destinations in Australia, but be aware many accidents occur (mostly due to speeding), some with fatal results. 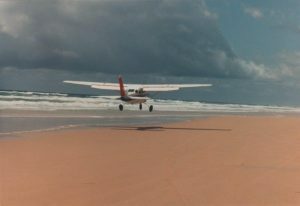 The beach is a public road and classified as a highway, but you also must share this with small airplanes. 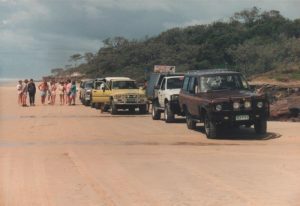 Maximum speed on the beach (surfside) is 80km per hour and on the inland tracks 35 kilometre an hour. 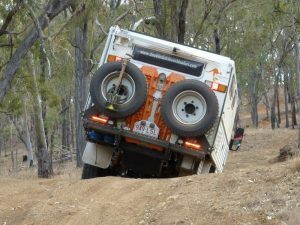 Lower your tyre pressure. 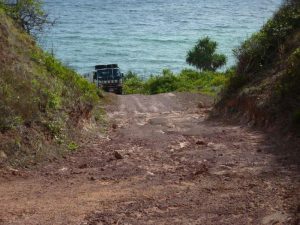 The island has great beach driving and many inland tracks to explore. 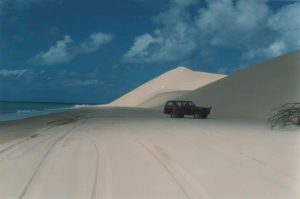 Fraser Island is the world largest sand Island and is part of the Great Sandy National Park. 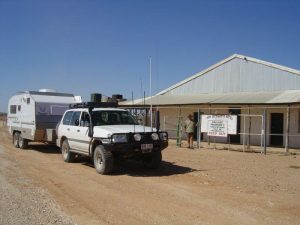 In recent years the Island has improved its facilities and has many developed camp sites and a few general stores. 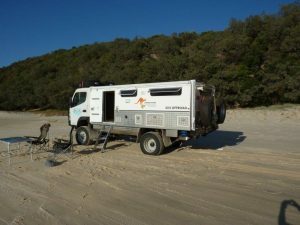 Fraser Island is a must do destination with its natural beauty, more than 250KM of ocean beach, rainforest, dune lakes, white water lakes and black water lakes. 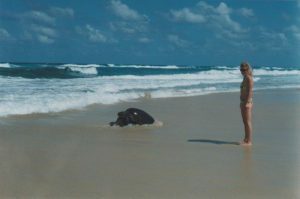 On the west side of the Island between August and October chances are you see Humpback whales. 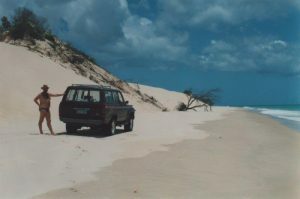 Remember permits are required for Fraser Island. 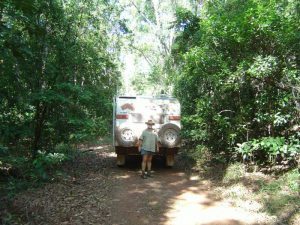 Coming from the north follow the signs to Hervey Bay followed by signs to River head. 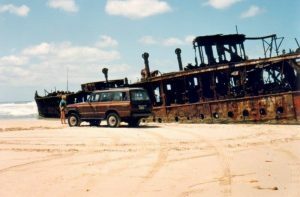 For more info click https://www.kingfisherbay.com/getting-here/fraser-island-ferry.html I was advised that you now need to book this ferry! This must be new as we never had to. 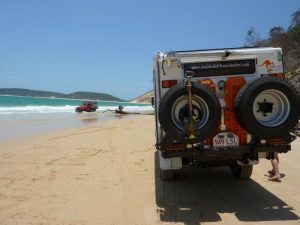 Coming from Brisbane you have several choices, but the easy way is to follow the signs from Gympie to Rainbow Beach and onto the beach to Inskip Point. 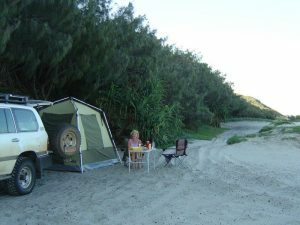 The alternative would be to drive to Inskip Point from Cooloola National Park. 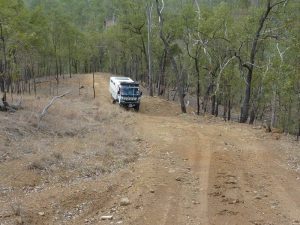 The coast road from the Sunshine Coast to Cairns covers a variety of terrain from dry flat plains to tropical forest. 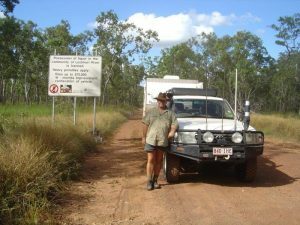 Following the coast road, this road is sealed all the way to Cairns. 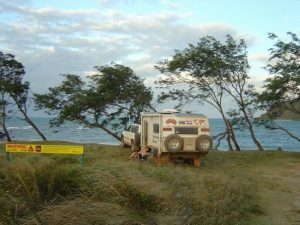 You can stop off In Bundaberg at Mon Repos National Park, Cape Palmerstone National Park, Airlie Beach and the Whitsundays Islands, Townsville and Magnetic Island and Mission Beach before reaching Cairns. 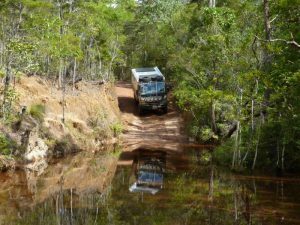 Alternative you can follow the inland roads and make stops in Carnarvon Gorge National Park, Blackdown Tableland National Park before you follow the highway again till MacKay, where you can turn off to Eungella National Park and then return to the Coastal Highway. 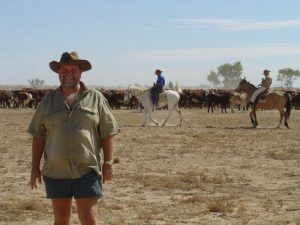 The Queensland Outback this is where you stop to talk to drovers, prospectors, pub owners, road train drivers and farmers. 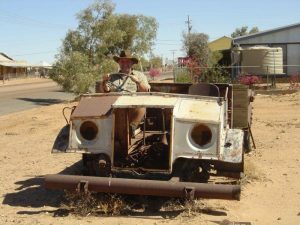 This is where you walk into an outback pub and have a beer with the locals and this could be a local farmer or the mayor of the town. 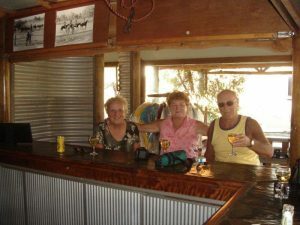 The pub can be a grand old building or a tin shed. 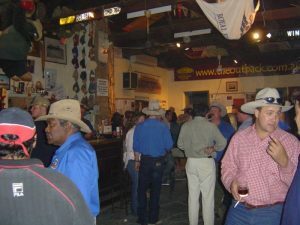 Visit the local rodeo or the annual horse race. 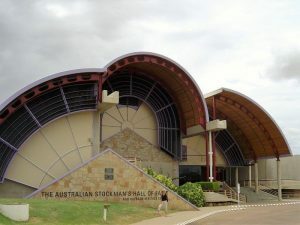 In Longreach visit the birthplace of Qantas and the Stockman’s Hall of Fame, also interesting is the school of Distance Education which provides education to those on the outback stations up 1000 kilometres away. 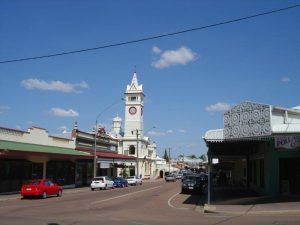 In Winton you will learn about the song “Waltzing Mathilda” and “Once a Jolly Swagman camped by a billabong”. 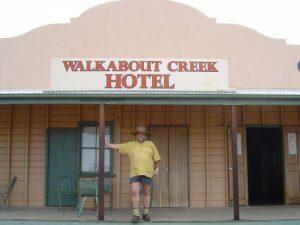 Both originated in Winton and you can visit the combo waterhole. 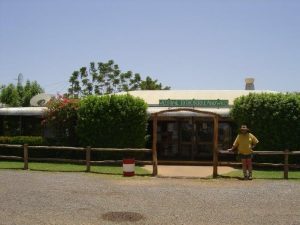 Also visit the Waltzing Mathilda Centre where you will learn about Banjo Patterson. 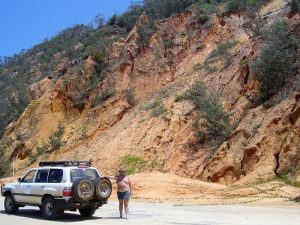 You can visit Queensland oldest Opal fields in Opalton and Lake Quarry where you find 90 million years old dinosaur fossils. 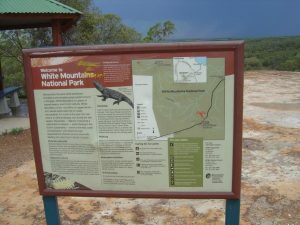 The major parks in the area are Diamantina National Park, Bladensburg National Park, Wellford National Park and Elizabeth Springs. 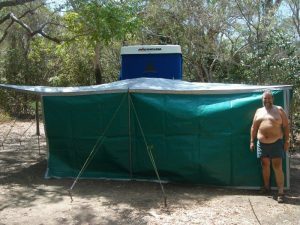 It is here where you learn the Outback salute to keep the flies away. 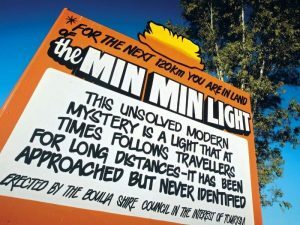 Boulia is the home of the mysterious Min Min Lights. 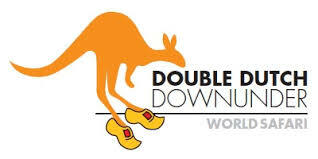 In July Boulia host the famous Camel races. 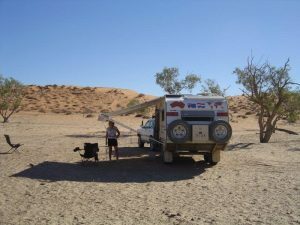 South of Boulia is the small outback town of Bedourie, (Bedourie means sand storm) with a population of just over 100 people. 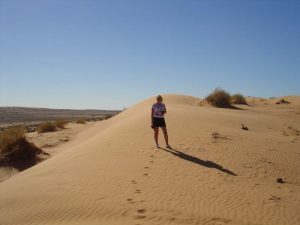 This is also near the Diamantina National Park an area that covers treeless plains and sand dunes. 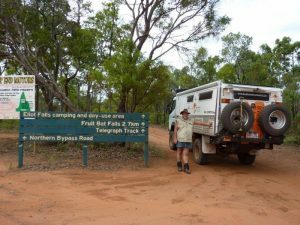 If in the Park must do stops are Janet’s leap lookout, and the Warracoota drive. 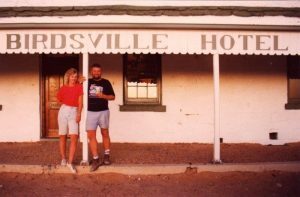 Another must do town when in this area is Birdsville, Queensland’s most remote town with a population of 100 and a famous pub and the gateway to the Simpson Desert. 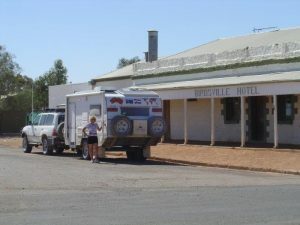 This has made Birdsville to a thriving community with a caravan park, service station all to serve the large amounts of 4WD drivers crossing the Simpson Desert. 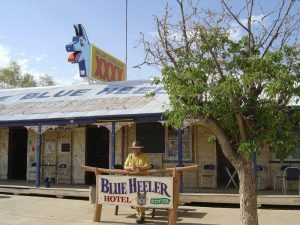 During the annual Birdsville races (September) up to 10000 people visit the town for 2 days of fun and alcohol. 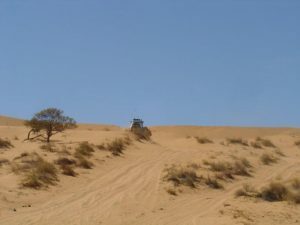 Just out of town is the first sandhill when you start crossing the Simpson Desert called Big Red, around 50 meters high and part of the world’s largest parallel sand dunes. 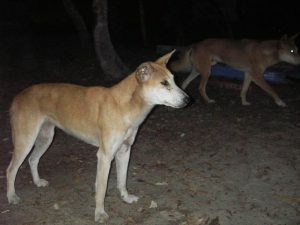 Some are over 200 kilometres long and over 90 meters high. 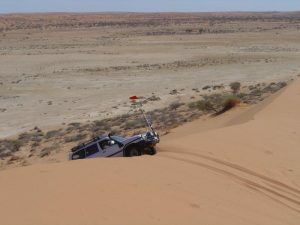 From here you can travel west and cross another 1140 parallel dunes in the Simpson Desert. 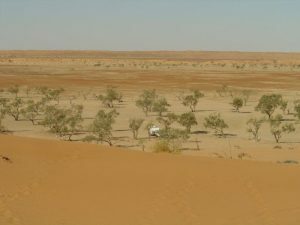 The Queensland part of the Simpson Desert is over 1 million hectares and is Queensland’s largest protected area. 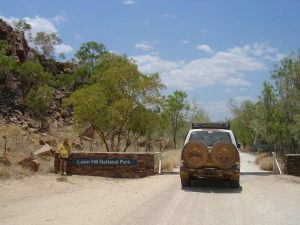 I am told that rangers now close the park in summer when temperatures reach over 50 degrees Celsius and hardly ever drop below 40. 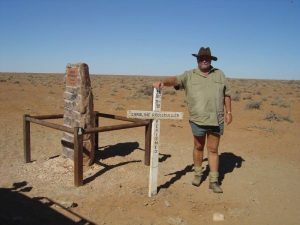 Poeppels Corner allows you to stand in 2 States and one Territory (South Australia-Queensland and the Northern Territory). 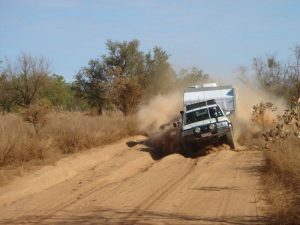 South West of Quilpie you will find Cameroon Corner. 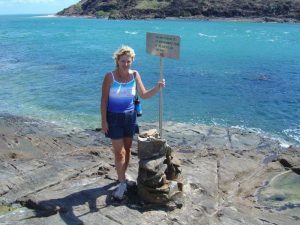 This is where New South Wales-Queensland and South Australia meet. This now has a small museum where the history of the dog fence is explained, and it now even has a small store. The dog fence is the world’s largest fence. 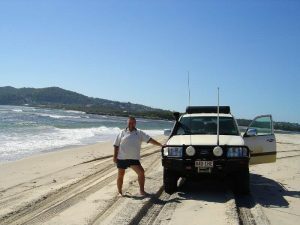 (5500kilometers long) A must do is to play golf with 3 holes in Queensland-New South Wales and South Australia each. 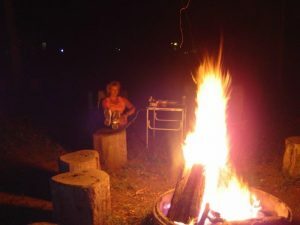 If you happen to be here on New Years Eve where in the world could you party on New Year’s Eve with 3 different time zones! 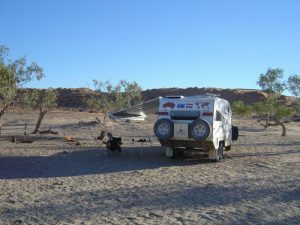 From here easy drives to Innamincka in South Australia or Tibooburra in New South Wales. 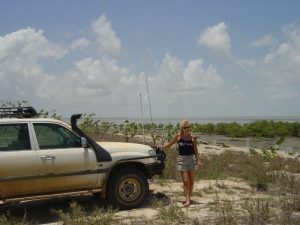 Both islands are just off the coast from Brisbane and easily accessible. 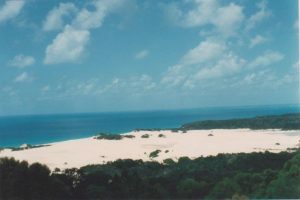 Moreton island is nearly all silica sand. 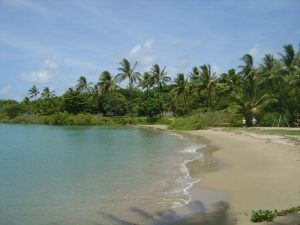 The island is just 36 kilometres long and has great beaches. 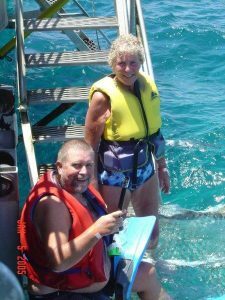 The Moreton Bay side of the island is where you will spot Dolphins, Dugongs and Turtles. 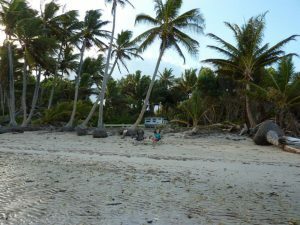 Be warned this is a tourist island and during weekends and holiday periods you will not be alone. Nevertheless, it is a great destination. More residential and more populous Stradbroke still has a lot to offer. 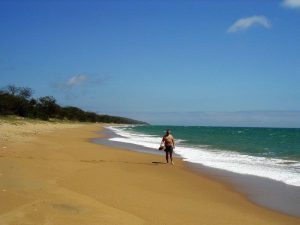 Stradbroke or Straddie as it is also known is just 1 hour from Brisbane by ferry. 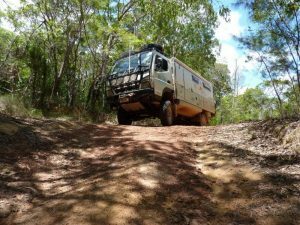 Drive off road to explore the more remote areas of Stradbroke. 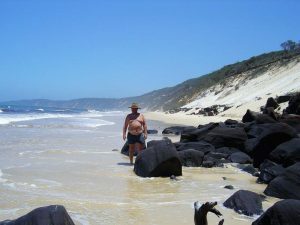 Visit Point Lookout for great scenery and between June and November you may spot whales. 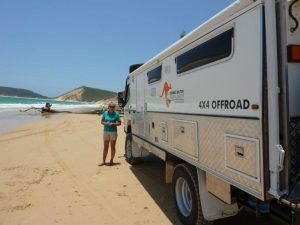 Flinders and Main Beach are open to 4WD, but you do require a permit. 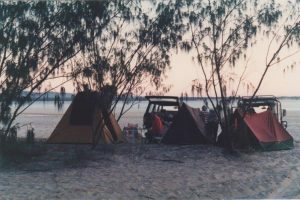 Be aware of the tides when setting up your camp on the beach, ensure you are above the high-water mark. This is where we live, so I may be biased. 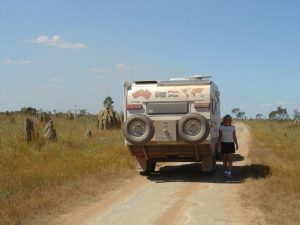 The main reason we live here is mainly for its wonderful tropical climate and the proximity to the Great Barrier Reef, the rainforest and the outback. 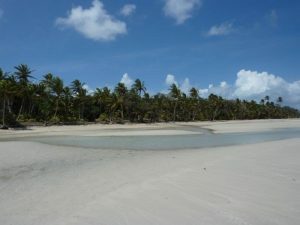 This area offers it all with the backdrop of lush rainforest clad mountains and the azure blue water of the coral sea. 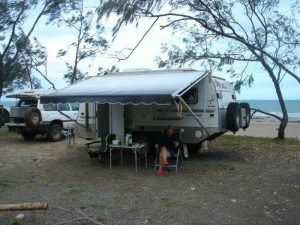 Our house is located 20 kilometres north of Cairns in Clifton Beach. 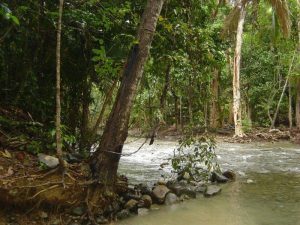 Cairns offers everything from great restaurants, bars and shopping centres to perfect palm fringed beaches. 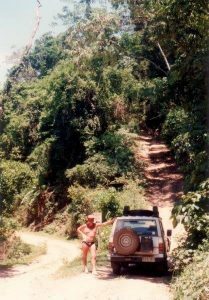 60KM north of Cairns you find Port Douglas, not far from the Daintree National Park and Cape Tribulation. 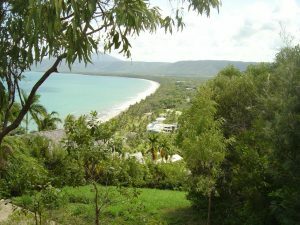 Port Douglas is a small village with a great village atmosphere. 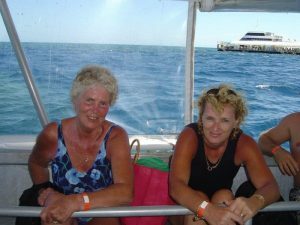 From both Port Douglas and Cairns many boat trips are available to the Great Barrier Reef. 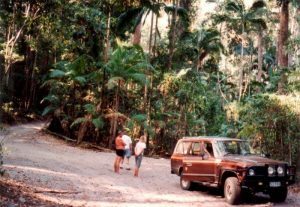 The Daintree National Park is a World Heritage listed area and with 1200 square kilometres it is the largest tropical rainforest in Australia. 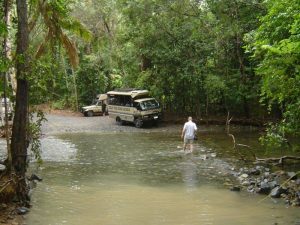 Part of the area is Mossman Gorge and River with plenty of nice rock pools. 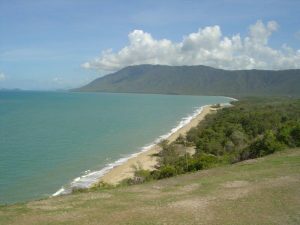 The coastal road north of Cairns to Port Douglas is argument able one of the most scenic drives in Australia. A must do visit is the Great Barrier Reef one of the world’s seven wonders and the largest reef system in the world made up of 900 islands and nearly 3000 reefs stretching over 2600Kilometers with crystal clear water, allowing you to witness colourful coral, sea turtles, stingrays, and hundreds of tropical fish, while snorkelling. 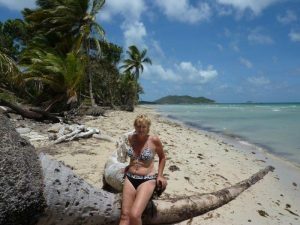 Off the coast of Cairns 2 easily accessible islands are Green Island a beautiful coral cay with golden beaches and a resort and Fitzroy Island. 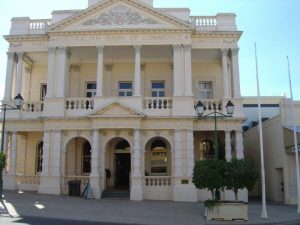 This island hosts some great entertainment on weekends and during school and public holidays. 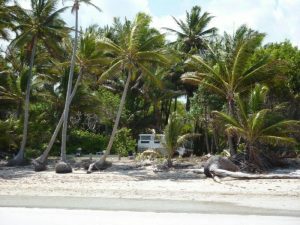 Off the coast from Port Douglas is Low Isle 2 separate islands with great snorkelling and a spectacular tropical reef. 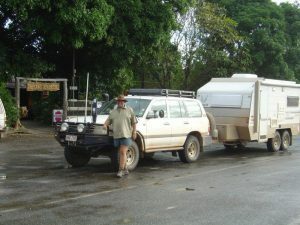 Once leaving Cairns you are driving up the Great Dividing Range to the south west of Cairns. 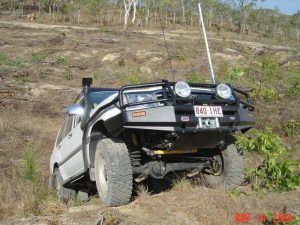 This is a lush and green fertile plateau called the Atherton Tablelands. 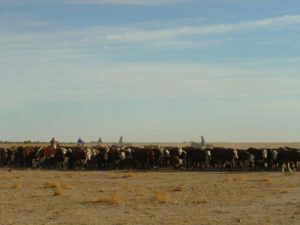 The fertile soil is great for farming. Coffee, Mango and Macadamia are some of the items grown here. 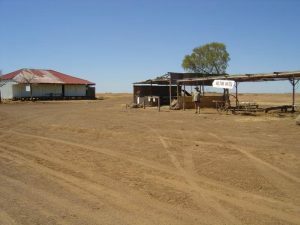 Dairy farms also thrive in the Tablelands. 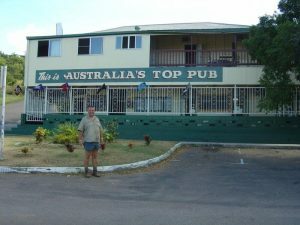 The Tablelands are a great escape from the heat and humidity around Cairns between October and May. 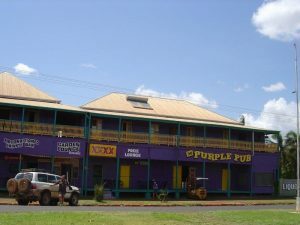 In the northern Tablelands some of the more interesting places to visit are Rain Forest Station Nature Park, Kuranda Rain Forest Village, Australian Butterfly Sanctuary, Granite Nature Park, Mareeba Wetlands, Coffee Works, Mount Mulligan ghost town and the Tyrconnel Historic Goldmine where once 10000 people lived around the mine. 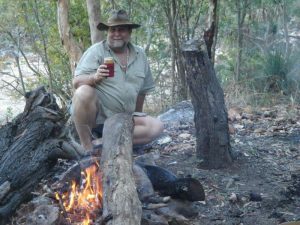 In the central Tablelands areas to visit are Irvinebank, Herberton, Lake Eacham in Lake Eacham National Park, Lake Barrine, Lake Tinaroo, Malanda Falls in Malanda, The Fig Tree in Yungaburra but also visit the Cathedral Strangler Fig Tree and the Giant Red Cedar Tree. 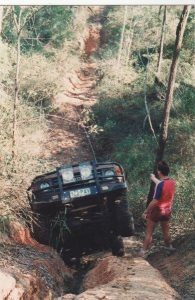 In the southern part of the Atherton Tablelands you find Mt Bartle Frere (Highest mountain in Queensland) and Mt Bellenden located in Wooroonooran National Park, Millstream National Park, Tully National Park, Millaa Millaa waterfall and the Millaa Millaa Waterfall Circuit. 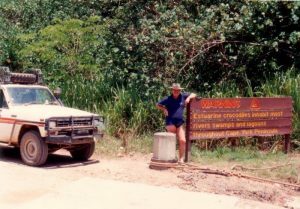 From either Mt Garnet or Chillagoe, you enter the Gulf Region. 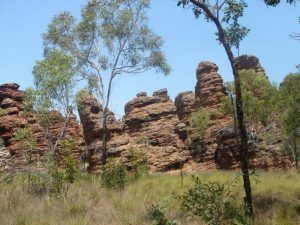 This area covers the shores of the Gulf of Carpentaria and the country surrounding the many rivers between Chillagoe and the Northern territory border all the way South to the line Camooweal, Mt Isa, Cloncurry Julia Creek and Richmond. 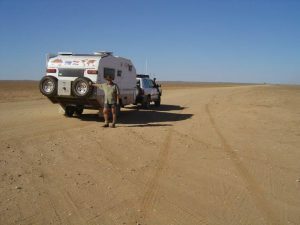 All up over 430000 square kilometres of mostly arid and savannah country. 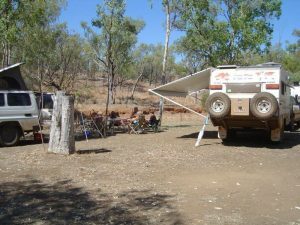 You will find great camp spots near rivers and in deep gorges. 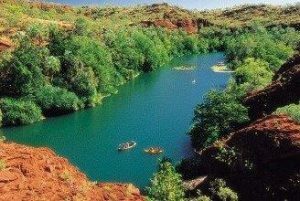 This area is home to some large mines including the Mount Isa Copper Mine, McArthur River and Century Lead-Zinc mines. 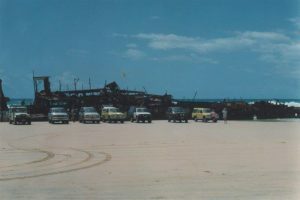 Also, fishing is a major industry in this region. 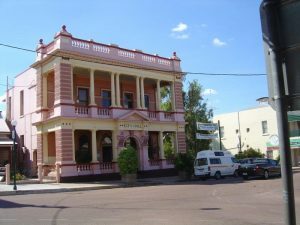 The major city in this region is Mt Isa. 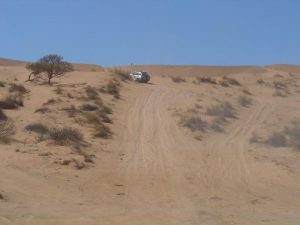 This whole area is also called the Gulf Savannah and is crossed by the tourist Savannah Way. 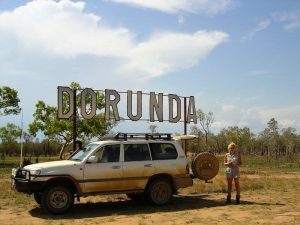 The number one tourist attraction in the area are The Undara Lava tubes in Undara Volcanic National Park, one of the country’s most spectacular geological wonders. 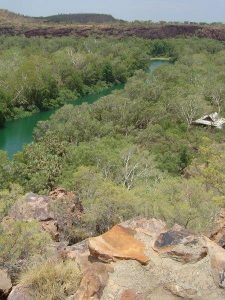 The Park is home to one of the largest lava tube cave systems that stretch over 160km. 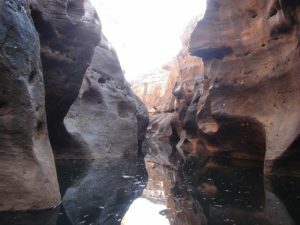 There are guided tours to take you through the caves. 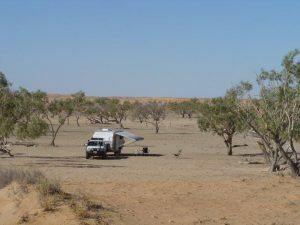 Number two tourist attraction is Lawn Hill National Park around 200 KM north of the Barkly Highway. Lawn Hill Gorge gets fed by Lawn Hill creek via many fresh water streams from the limestone plateau to the west of the park. 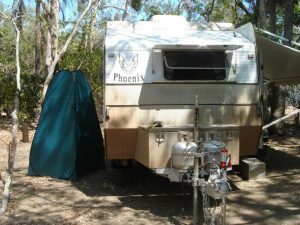 The rivers here flow year-round. 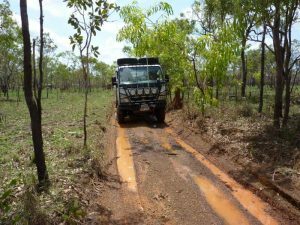 Like everywhere in the far North road conditions are subject to the weather, also be aware of patches of bulldust. 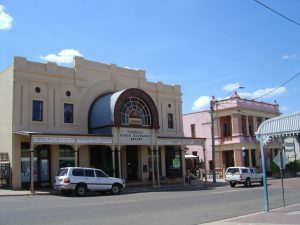 Places to visit include Moorrinya National Park, Porcupine Gorge National Park, White Mountains National Park, Camooweal Caves National Park, the Australian Fossil Mammal Site at Riversleigh, Charters Towers the town built during the Gold rush of the 1800’s, Mount Isa and its Royal Flying Doctor base, and its underground Hospital. Not to be missed is the Mine tour. 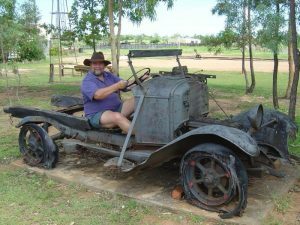 Cloncurry is the birthplace of John Flynn who established the Royal Flying Doctor service, don’t miss a visit to the John Flynn museum, Chillagoe Caves and Chillagoe Montana National Park and Cobbold Gorge. 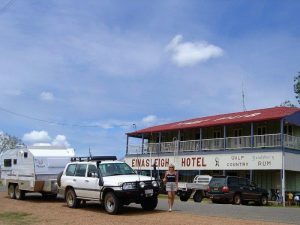 Brisbane is the capital city of Queensland and a real outdoor cosmopolitan hub. 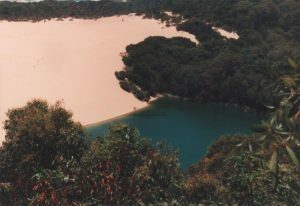 It is also the gateway to the Gold and Sunshine Coasts and the hinterlands. 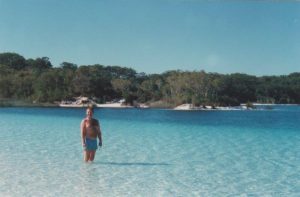 In the city itself I would visit South bank, the old EXPO88 site, converted into an area with lots of restaurants and bars, a large swimming pool/lagoon, lots of lush parkland with great river views, overall a great place to relax. Lone Pine Koala Sanctuary located in Brisbane’s North West is the world’s largest koala sanctuary with just under 200 koalas. 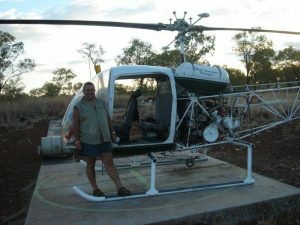 Here you can hold a koala or feed a kangaroo, watch a platypus or see sheepdogs at work. 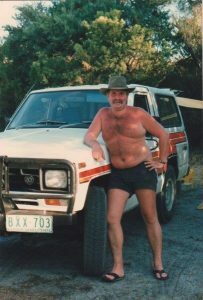 South of Brisbane is the Gold Coast, the Miami of Australia. 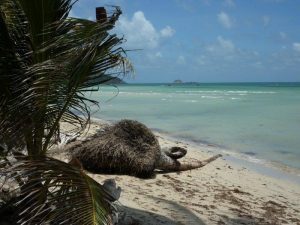 Nearly 80kilometers of coast line full of hotels, high rise apartments, restaurants, bars, theme parks, and great beaches. 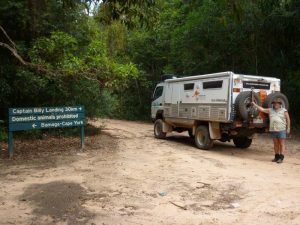 Visit the Tambourine Mountain area and Springbrook National Park, Currumbin Wildlife Sanctuary, Lamington National Park and the Gondwana Rainforest World Heritage area. 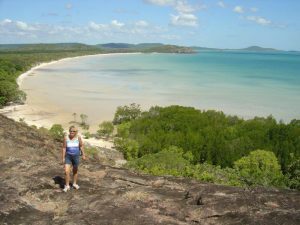 The Sunshine coast north of Brisbane is a mix of great long beaches (over 100 kilometres) and a beautiful green lush hinterland. 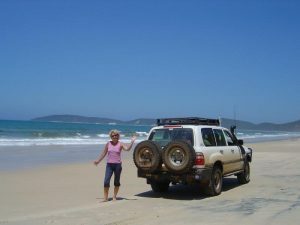 Famous beaches are around Noosa, Caloundra, Maroochydore, Mooloolaba and Cotton Tree. 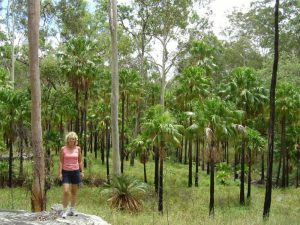 Great National Parks around Noosa and the Glass House Mountains. 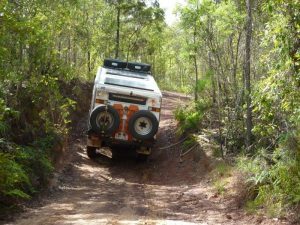 Waterfalls and 4WD drive tracks around Kenilworth and the scenery around Maleny. 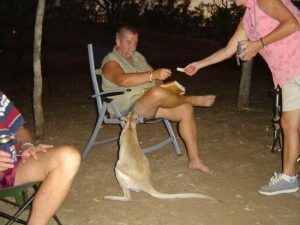 Australian Zoo was founded by Steve Irwin’s parents and later operated by Steve Irwin 22-02-1962 –0 4-09-2006 and his wife Terri. 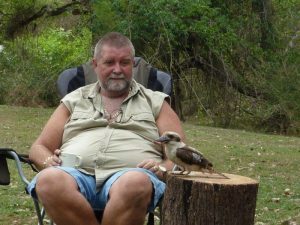 It is a great Zoo to visit when exploring the Sunshine Coast hinterland. 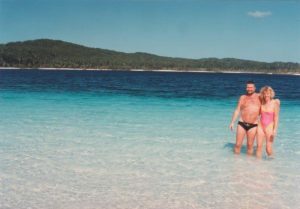 (Steve died just off the coast where we live (Batt Reef). While swimming in chest deep water he was stabbed, and the stings ray barb pierced his heart causing him to bleed to death). 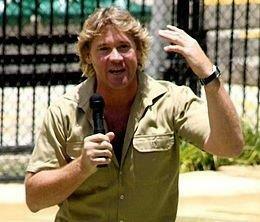 A must do is a selfie of yourself and the Steve Irwin sign at the entrance to the Zoo. 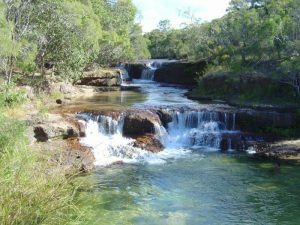 Other areas worthwhile visiting are Conondale National Park and Mapleton Falls. The Eumundi markets are a must to visit on a Sunday.